Drew Stargrove (Lazenby) is a top-secret super-agent who has discovered that an awful plot is hatching: The evil Ragnar (Simmons) is going to poison the water supply of the Los Angeles area. When the ruthless Ragnar kills Drew, his son, the younger, more mulleted Stargrove, Lance (Stamos) must pick up where his father left off. Teaming up with the beautiful Danja Deering (Vanity) and his roommate Cliff (Kwong), who is an inventor of wacky, but helpful gadgets (no parallels to James Bond here), they set off to stop Ragnar and his minions. Where to start with this classic? Never Too Young To Die is a very, very fun and highly entertaining movie - they truly do NOT make ‘em like this anymore. Lance Stargrove is a gymnast and Ragnar is a transvestite who performs under the name “Velvet”. Any movie with George Lazenby, John Stamos, Vanity and Gene Simmons - not to mention Robert Englund - is going to be a rare gem indeed and the movie does not disappoint. To quote the back of the VHS box (released by Charter), Vanity and Stamos “...must take on the maniacal hermaphrodite.” If that doesn’t pique your interest in seeing the movie, you’re probably dead. And they wrote that like it’s no big, unusual thing. God bless the 80’s. Simmons really throws himself into the role he was clearly born to play. Perhaps a bit too much. John Stamos should have done more movies like this. His only other role that’s even a little bit similar is as the awesomely-named Grady Westerfall in Born to Ride (1991). 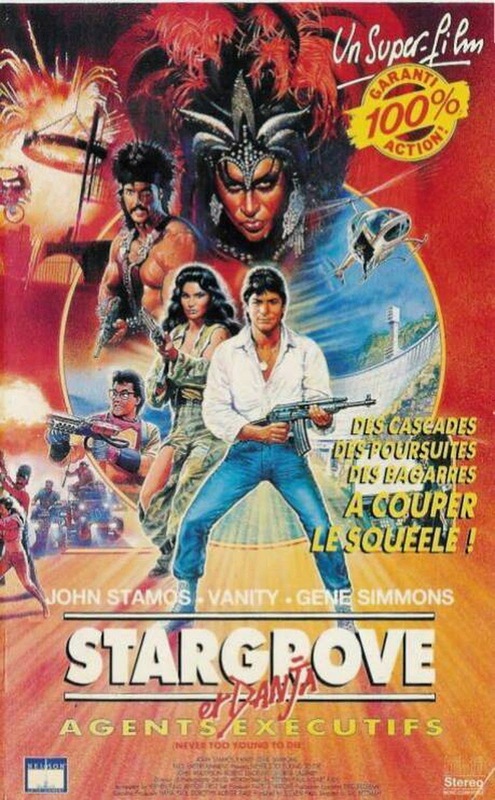 There really should have been a Stargrove sequel - even a franchise, like Bond. They certainly say the name enough times, in true Brakus fashion. The whole thing was directed by Gil Bettman, who later directed Night Vision (1997). But this was indisputably his finest hour. The movie tries to marry the action to typically-80’s comedy stylings, and the whole movie, from the names of the characters on down, has a very comic-booky feel. This was typical of the time as movies like The Adventures of Buckaroo Banzai Across the 8th Dimension (1984) and The Perils of Gwendoline in the Land of the Yik Yak (1984), among other examples, clearly shows. Thanks to all the weird, goofy, wacky and funny scenarios, time speeds by when watching this gem. The theme song by Tommie Lee Bradley is memorable as well. For a true crowd-pleaser, seek out Never Too Young to Die. Great movie! Easily Gene Simmon's best role. Can't agree more! He was excellent as Ragnar. Need to check this out. Haven't heard of it until your review - sounds like a pretty interesting flick. Whoa! Uncle Jesse aka John Stamos in a movie like that! I'd definitely love to check it out plus Robert Englund is in it! Sweet! I was waiting for you to get to this one. One of my absolute favorite "WTF?" films ever! I love it! If all my posts on it didn't convince you of that, I don't know what will. lol. Great job guys! Clearly Simmons finest hour. Only problem is that I never shook that disturbing song and dance number out of my head. It still haunts me. But having Vanity sexier than ever certainly helped. And I agree, Stamos should have done more like this. Hell, they should have just made more Stargrove films, even if they were DTV. That would have been awesome! Jack: We live to turn people onto movies like this, would be interested in your opinion! Real Queen Of Horror: It's Uncle Jesse as you've never seen him before! RobotGEEK: We completely agree! The world is emptier for not having more Stargrove sequels. It is Vanity's, Stamos', Simmons', and even George Lazenby's finest hour! Totally agree about Vanity: she is a very beautiful woman! Oh yeah, this film was a blast! simmons was also pretty good in Runaway and Wanted:Dead Or Alive. Too bad his acting career didn't last longer. That is very unfortunate. He should have been in more movies like this! You know it had never occurred to me that George Lazenby ever worked again after OHMSS. From that to this film. Bizarre. It is totally bizarre! Lazenby was in (soon to be reviewed) martial arts classic: The Man From Hong Kong! I haven't seen this in forever. Thanks for bringing it back into my consciousness. I'll have to check it out again soon. No problem, buddy! This definitely worth a re-watch in the future!